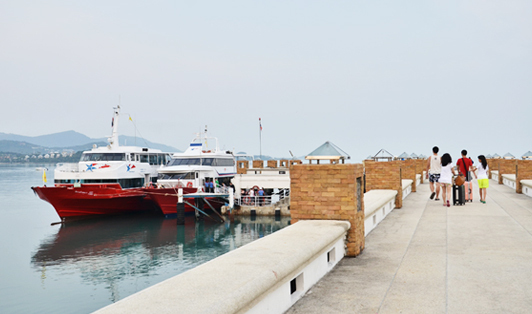 Bangrak Pier is also known as "Big Buddha Pier" due to its close proximity to (you guessed it) a fairly big 12m high Buddha that rests on the hill of a nearby island. The pier has recently been given a really nice upgrade that makes it a pleasure to arrive from and depart to, with a couple of nice restaurant/bakery shops to wait in. All is fairly well organized, and the pier staff are quite helpful. The good news for FerrySamui.com travelers is that the pier staff know us well and are familiar with our customer service processes.